! !FULL VIEW IS A MUST!! This is the story of a planets life, its birth, its childhood, and finally its ability to wield life. This is a process that happens without ever stopping, in a Universe so vast that its unimaginable. Its something that happens an infinite amount of times, and each time its different. This is my attempt to depict a planets life story....in 1 image. From left to right! Alexei Kozachenko proudly presents: AD INFINITUM!! This image took me roughly a month or more to complete. It is definately a project ive worked on longer than any before and it has been exhausting. But finally im done! hours and days and weeks of work! And from this piece I did an art analysis in my school! Great texturing, lighting is fabulous, the composition really attractive... Awesome! Man... man... this is a piece of God, TRULY! Love the colors and the deep textures. Great work with the symmetry too! This has become the wallpaper on my laptop. It is that awesome; I especially like the duality aspects. Sweet lord, this is beautiful. words cant describe this image its more than great, beyond breathtaking a master piece! I can't find the right words to say just how breathtaking this is. It's so inspiring and detailed, and... Wonderful . I love it. 0.0 GEzzzz thanks amazing!!! Great work! One of the best works i've ever seen! 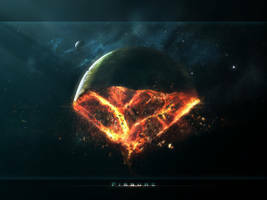 Awesome compisition, nebulas, starfeilds, planets,...e.c.t. So why havn't ya the psd online yet? 1 Question, I noticed that your main planet texture has clouds. Were those clouds part of the textures you used, or did you overlay a cloud map? Vvverrry good either way.